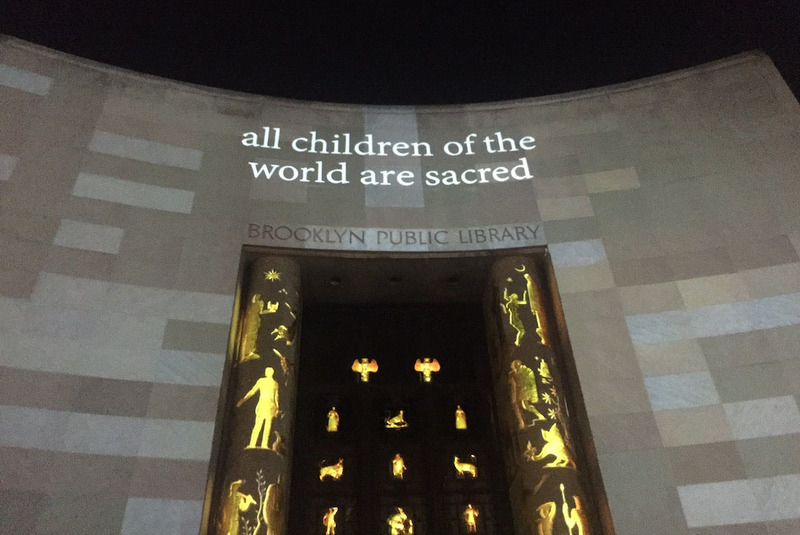 The Brooklyn Public Library has commissioned a series of digital projection artworks to be displayed on the facade of the Central Library at Grand Army Plaza in Brooklyn. Programmed by BPL Presents and dubbed ‘The Brooklyn Gaze,’ this special event series aims to start a community dialogue around the library’s vast archive using technology, multimedia and live experience. The first installment, ‘Erasure and Revelation’ by visual artists Mark Read and Jeanne Angel, was presented on May 18. ‘Erasure and Revelation’ made use of quotes from luminaries such as Sojourner Truth, Hannah Arendt, Spike Lee, Martin Luther King Jr. and James Baldwin, highlighting the library’s diverse catalog. At first, a lengthy quote engulfed the entire facade of the building; then words would disappear until only a few remained. Those lingering words came together at the top of the building to emphasize a short, essential question or piece of wisdom. At times, the projection made it look as though the stone blocks that form the building were in motion. The seven-story mapped projections were accompanied by a score by composer Paul Brill. A live musical performance by Les Nubians kicked off the event. The next installment of the Brooklyn Gaze, ‘Vox Populight,’ will be presented on Wednesday, June 21. All events in the series are free.